← Did The Evening Standard Libel MEND Today? 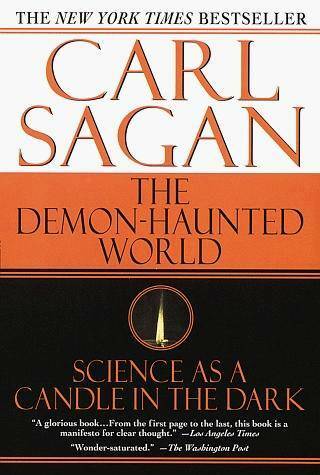 Published in 1996 – the year of his all-too-early death due to cancer – The Demon-Haunted World: Science As A Candle In The Dark, will inevitably be seen as Carl Sagan’s departing words urging the world to challenge superstition and irrational modes of thinking. A celebrated populariser of science, Sagan outlines his motivation right at the beginning of the book. Sagan rightly laments the harm that has been caused through unquestioning attitudes towards ‘Holy Books’. The Bible’s injunction “Thou shalt not suffer a witch to live” led to the loss of countless lives in Europe where witch-burning continued to be a popular pastime right up until the rise of the scientific revolution. Instead, science and scientists like Carl Sagan, would rather that we examine the reason why earthquakes occur more frequently in particular regions of the world and study plate tectonics and their relationship to earthquakes with a view to putting some thought into what can be done to limit the damage they can cause. It is a rational and sensible way to deal with a tragic natural phenomenon. There does not need to be a conflict between science and religion, according to Sagan, but it requires vigilance and action to ensure that the bigots do not triumph. One particularly compelling chapter of the book is devoted to what Sagan calls his Baloney Detection Kit, to help equip us with the tools to facilitate critical thinking and help prevent us falling prey to those would try and restrict our freedom to subject all ideas to criticism by declaring some topics off-limits as sacred or taboo. The Demon-Haunted World is a passionate appeal to question and challenge all forms of irrational thought. Over twenty years after its original publication, its message remains as relevant as it was in 1996 and perhaps even more so. This entry was posted in Books, Science & Evolution and tagged carl sagan, demon-haunted world. Bookmark the permalink.